People need to get in touch with people working at certain companies for a lot of reasons. For exploring a business partnership, to explore a marketing opportunity, soliciting a favour, for an employee reference at the company, what have you. However, finding a contact in that company can be tricky. While most people would ask around, there are more ways than one to increase your hit rate of finding the one. Linkedin is the number one professional networking website in the universe and chances are that 9/10 the person you’re looking for has a profile up there. So just look up by company or by connections. Even after finding the person you need, you may not be able to send them a message, unless you’re connected. So, send a connection request or if you can afford it, use the premium inMail option that lets you message people who’re not connected with you. Duh! Most companies have a contact us page, if not prominently displayed, then somewhere at the deep bottom of the page. Locate it and send your email, trying to keep the subject line as specific, because the email is likely to be first read by a customer care exec or admin. This option is not exactly efficient for getting right to the person you want or ensuring a quick reply. Try these others first. Duh again! You obviously thought of this option, but did you? Sometimes we miss the most obvious option. Use the search feature on Facebook. If you already know the name of the person you’re looking for, it’s easy peasy. But how do you search by their company? Still the same. 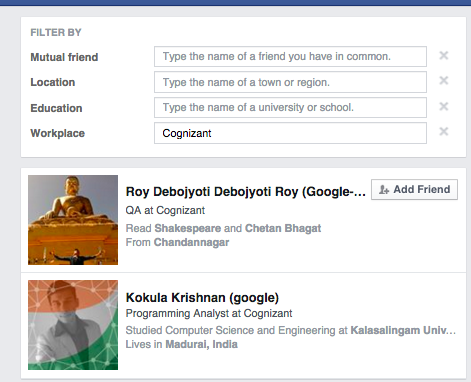 Just type the company name in the filter by search box and Facebook will populate a list of people whose ‘works at’ matches with the company name. The Facebook page of a brand is usually manned by social media executives who can pass on your message to the higher ups. But in cases of startups, most co-founders, and marketing managers regularly check the page messages too. So, use the message option on the brand page. Since Facebook now has the option of displaying how responsive a brand page is, the company has an additional pressure to respond and in time. Now while most people tend to be anonymous on Twitter, leave alone have their company mentioned in the bio, a not-so-obvious way to get to someone from that company is go to the Twitter handle of the company and stalk a few of its tweets. Do you see a common name among all the Retweets/Likes on those tweets? It’s likely to be someone associated with the company. Tweet to them and get the conversation on DM (Direct messaging) to set the ball rolling. Twitter by far is one of the fastest ways to look up someone, and start a conversation. 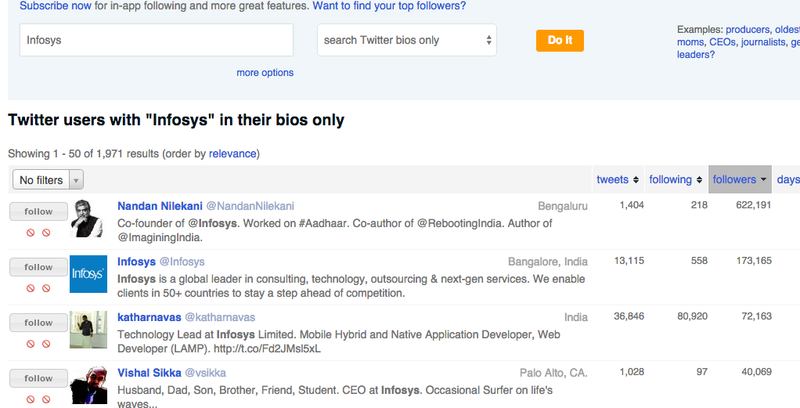 Another great option to look up people by the companies is use Follower Wonk, a webapp by Moz that lets you look up profiles by keywords in their bio. If all of this doesn’t work out, there are startup groups for each city, and PMIT groups on Facebook with thousands of members. Chances are someone will know someone who can help you get a connection.